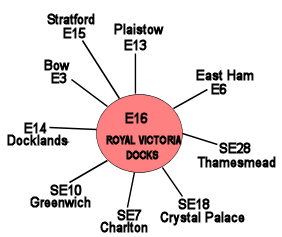 Nearest: DLR Station: Custom House 0.1 miles (0.2 km), Tube Station: North Greenwich 1 miles (1.7 km), Railway Station: Charlton 1.6 miles (2.6 km), Motorway: M11 Junction 4 6 miles (9.7 km). Fox Apartments are located alongside the Royal Victoria Dock very close to the ExCel Centre and close to London City Airport. Within a few minutes by road from Docklands/Canary Wharf this area gives access to east London as well as into the City of London itself via the dual carriageway that runs right through the Docklands towards Tower Bridge (Aspen Way, A1261). 20 minutes by train from the O2 Arena which is just the other side of the River Thames. Nearest attractions include the Old Royal Observatory, Gipsy Moth iv, National Maritime Museum and the Cutty Sark. Fox Apartments hosts a plethora of amenities to make your stay as comfortable and convenient as possible, combining the facilities of a hotel with the freedom and extra space of serviced apartments. Enjoy the on-site restaurant, Café and snack bar, as well as daily newspaper service, business services, dry cleaning service, and meeting facilities. Every apartment is tastefully appointed in a contemporary style with two floors (duplex) of living space, including reception rooms and a master bedroom with en suite. They come with a fully equipped kitchen (utensils, ridge, hob, oven, dishwasher, microwave, washing machine/tumble dryer, kettle and toaster) and dining room. Amenities include direct dial telephone, hairdryer, WiFi internet connection, a balcony or patio, coffee/tea maker, plasma screen television with digital channels and DVD/CD player and surround sound system, iron and ironing board, and a washer and dryer. The executive suites offer self-contained studies for the business traveller. Apartments have 2 bathrooms with free toiletries. The front desk is open 7am till 9pm. Check-in: 14.00 (2 pm) *minimum check-in age is 21. Public parking is available in close proximity to the hotel and costs £20 per day. Milesfaster ranking: 303rd from 866 London hotels, and 120th of 328 four star rated hotels. Just want apartments?, maybe have a look at the 196 Bishopsgate Apartments. The apartments are 0.5 miles (0.8 km) from here (straight line distance) with rates from £145 where guests have given it a rating of 82% and has: free WiFi. For somewhere with lower starting rates try the Re Shoreditch Hotel. 1.6 miles from the Fox Apartments (2.6 km), gaining a satisfaction rating of 74% from its past guests and the hotels starting rates begin at about £67 (theres free WiFi too). The fifty hotels that are closest to this location (2 Western Gateway, E16 postcode) which we list extend for a 2.9 miles (4.6 km) radius. They are made up of 3 five star hotels (average rating 91%), 18 four star hotels (average rating 84%), 18 three star hotels (average rating 77%), 8 two star hotels (average rating 75%) and 3 one star hotels (average rating 62%). Top 4 star hotel is Staybridge Suites London Stratford City at 91%. Top rated of the local hotels is Intercontinental London O2 Arena (5 star) at 93%. Base Rates: Base rates can indicate the lowest available rates for a particular hotel. This is a good general guide but as base rates do not account for special offers and one off deals they can only be a rough guide. The average base rate for all the areas hotels is £77 per night. From a low of £34 at Ibis Hotel Barking (2 Star, 76%) and the highest rates top out at £250 at Fox Apartments (this hotel) (4 Star, 90%). The following are the averages for each star level: Five Star average: £151, Four Star average: £87, Three Star average: £73, Two Star average: £52 and One Star average: £41. Using our in-house algorithm we rank hotels based on guest ratings and weighted for related factors. We have a ranking for Fox Apartments 3rd (joint) of 50 and 2nd (joint) for the 18 four star hotels in the area. Our base rate rank for the hotel is 50th of 50 (18th of 18 four star hotels.). We use the base rate ranking and review ranking for the hotel to get an overall ranking of 40th of 46 for sheer value for money (City View Hotel was top).